Dr Dowrick is that rare writer who combines psychological insight and training with a genuinely compassionate, grounded social analysis, as well as an authentically inclusive spiritual conviction inspired by the clarity of the wisdom traditions. Through her books, articles and committed use of social media, including Facebook, she reaches out to many thousands of people with an enriching message of increasing inner and outer wellbeing. Her guiding principle is the choice that each of us has to heal ourselves (grow in wisdom and appreciation of life) and contribute our part to the healing of the world. Her work warrants that rare accolade: “life-changing”. 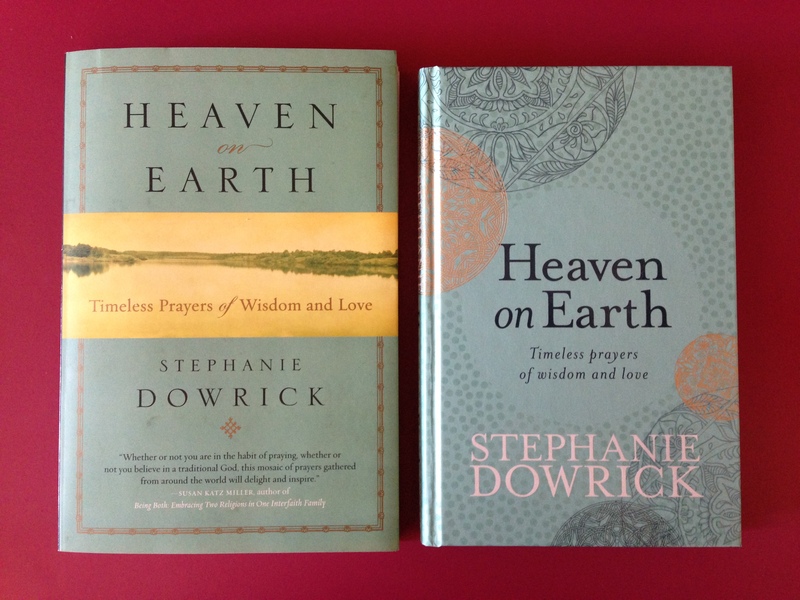 Stephanie Dowrick’s writing is distinguished by its originality, compassion and accessibility. She has had the rare distinction of having written five No.1 bestselling books. They include Intimacy and Solitude, Forgiveness and Other Acts of Love, Everyday Kindness, The Universal Heart and Choosing Happiness: Life & Soul Essentials. 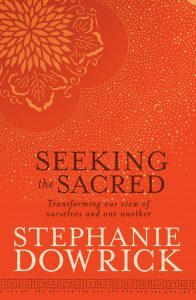 Her most recent books include Seeking the Sacred – called by Claire Scobie in the Sydney Morning Herald, “A chalice of wisdom” – Everyday Kindness, and her latest book, Heaven on Earth, about which Dr Marj Britt wrote: “Stephanie Dowrick emerges as a mystical poet with a radiance of her own.” Her most recent book for children is The Moon Shines Out of the Dark. One of Stephanie’s passions is teaching writing, which she has done intermittently for 30 years and more regularly since 2010. 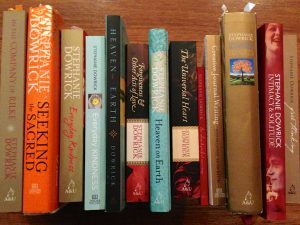 Books that especially express that aspect of her life include the highly successful Creative Journal Writing, and also the widely praised In the Company of Rilke, a rare scholarly spiritual study of the work of the European poet, Rainer Maria Rilke, taking readers also into a deeper understanding of themselves – and of the unique power of poetry. She is published in Australia by Allen & Unwin; in the USA by Tarcher/Penguin. Her books have been translated into many languages. Stephanie Dowrick was born in New Zealand, the second of two daughters. Both her parents were school teachers, her mother, Mary Dowrick (nee Brisco), a university graduate who both wrote and painted. Stephanie lived in Europe for many years from 1967-1983. She was co-founder and first Managing Director of the prestigious independent London publishing house, The Women’s Press, which published some of the most influential writers of the twentieth century, including Alice Walker, Janet Frame, Andrea Dworkin, Lucy Goodison, Joanna Ryan, May Sarton, Michele Roberts, Susan Griffin, Lisa Alther. She has lived in Sydney with her family since 1983. In 2017, she married Darwin paeditrician and refugee activist, Dr Paul Bauert. She is now a grandmother, as well as a mother. Stephanie is also a trained psychotherapist and for many years had a small private practice, alongside her work as a writer and her busy life as a mother. She was for some years well-being presenter for Breast Cancer Network Australia, and was an Adjunct Fellow with the Writing and Society Research Group at the University of Western Sydney (where she graduated with a PhD degree in 2008). She continues to offer intermittent specialist supervision. Stephanie was the very popular “Inner Life” columnist for Good Weekend Magazine from 2001-2010 (Sydney Morning Herald and The Age), and for many years was a frequent guest on ABC Radio. She continues to contribute actively and thoughtfully to public and social media, including the Sydney Morning Herald, Pearls & Irritations, and her inspirational PUBLIC Facebook page. In June 2005, Stephanie was ordained as an Interfaith Minister. 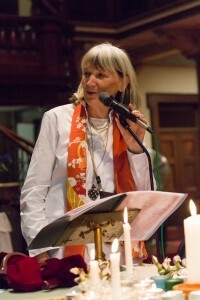 From 2006-2017 she led regular interfaith services and meditations at Pitt Street Uniting Church, Sydney. Talks from those services are available via this YouTube link. 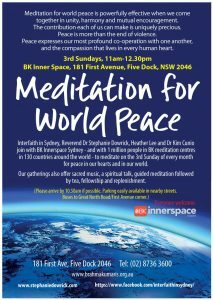 Along with music minister and sacred music composer, Dr Kim Cunio, she now co-leads sacred gatherings every 3rd Sunday of the month at InnerSpace Centre, 181 First Avenue, Five Dock. “World Meditation” commences at 11am – but we do ask you to arrive a little earlier if possible. 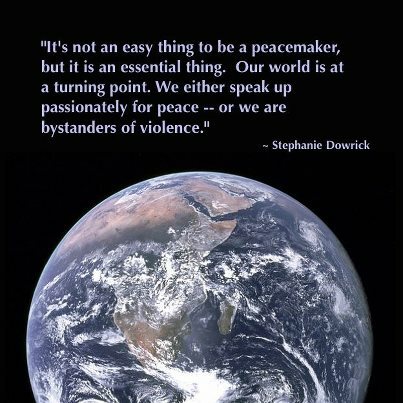 These gatherings include music, a talk (usually from Stephanie), refreshments to follow, in addition to peace-giving, led meditation. 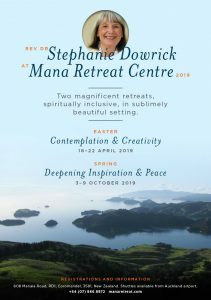 Stephanie Dowrick teaches frequently in New Zealand, including her two popular spiritually inclusive retreats at Mana Retreat Centre, Coromandel, New Zealand, where she has been teaching since 2000. She has for many years also given talks and workshops to a wide variety of groups and organisations. She has spoken at many events worldwide, and has shared platforms with many eminent thinkers including Tenzin Palmo, His Holiness the Dalai Lama, Rev Dr Don Cuppitt, Professor Raimond Gaita, Rev Dr John Polkinghorne and Bishop John Spong as well as BK Anthony Strano, BK Charlie Hogg, BK Sister Shivani, Subhana Barzarghi, Joyce Kornblatt, Reverend Hilary Star, Reverend Ian Pearson, Dr David Tacey and Dr Mark Burrows. 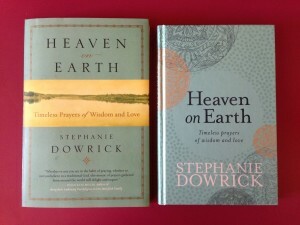 For a list of Rev Dr Stephanie Dowrick’s books and audio, go to Published Works on this site. You will also find there a selection of her many articles – as you will also via her “Blog”.